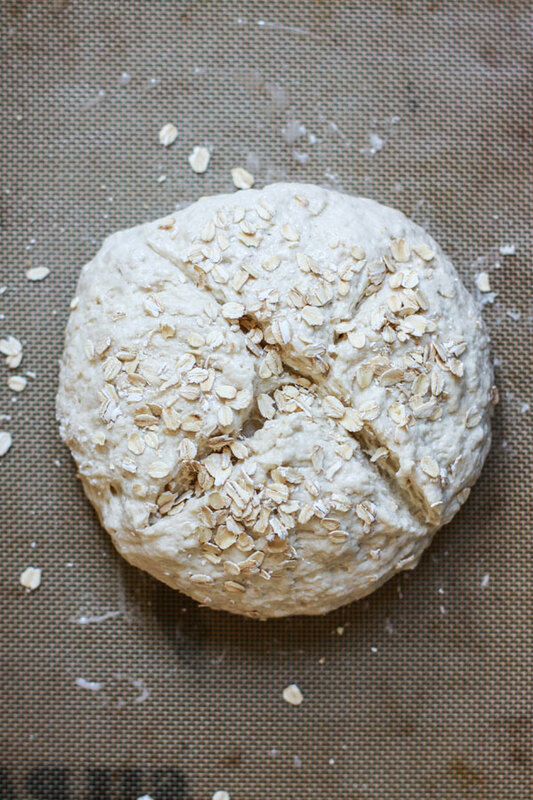 St. Patrick’s Day is on Sunday and a warm loaf of this oatmeal soda bread is the perfect way to celebrate! 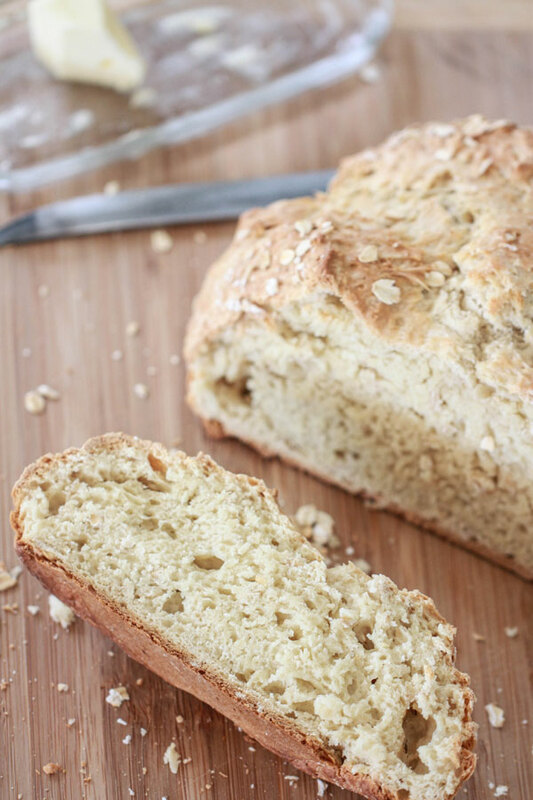 Irish soda bread is a very traditional type of bread, but I love the addition of oats! It makes the bread slightly heartier and gives each slice a satisfying crunch. This bread is bread is perfect for breakfast slathered with jam and Irish butter, or great when dunked into a steamy bowl of stew. If you’ve ever felt intimidated by the bread baking process in the past, this is the loaf for you! There’s no yeast involved, making it a great beginner’s loaf. And because there’s no yeast, there’s no need to wait on the bread to rise! Just mix up the ingredients in your bowl then transfer to the oven to bake. Easy as pie. I hope everyone has a great St. Patrick’s Day! 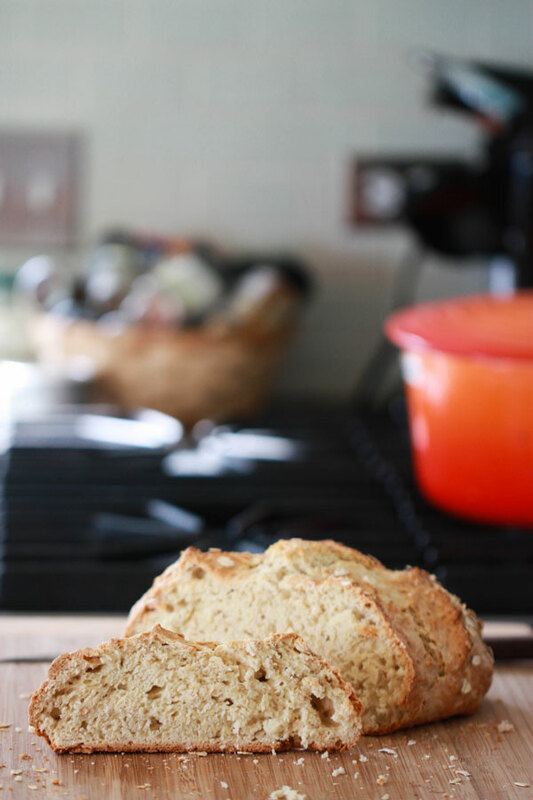 Add oats to this traditional Irish soda bread recipe for a heartier version with extra crunch. 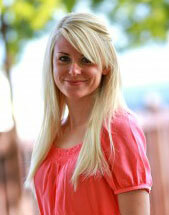 Food blogger Jenna Weber explains why this bread is great for beginners in a full post on the Fresh Tastes blog. In a large bowl, whisk together the flour, oats, baking soda, sugar and salt. Cut the butter into the dry ingredients with your fingers until no more large clumps exist. Combine the lightly beaten egg with the buttermilk. Pour into dry ingredients and mix. Dough will be wet! Using wet hands, form a large shaggy ball of dough and place on a parchment paper lined sheet tray. Cut an “x” in the center of the loaf with a knife and sprinkle oats on top. Bake for 50 minutes, until golden brown. Let cool for 10 minutes before slicing.